Don't you hate it when you're using WhatsApp and have to exit just to call someone? 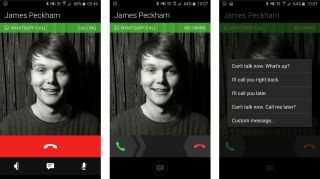 Well hate no more, as the messaging firm has just released its new in-app calling feature. The update is rolling out to Android smartphones in select markets, but if you can't wait for the app update to appear in Google Play then head to whatsapp.com/android and download version 2.12.19. We downloaded the update from the website and the new-look WhatsApp now has a tab imaginatively called "Calls" - which is where you'll need to head it you want to get on the phone with a friend. You can also start a call from within a chat with a contact - just hit the phone icon at the top of the screen - making it easier to get on the phone and tell them just how much you love their new haircut, or whatever it is you talk about with your friends. If someone calls you via WhatsApp you get a familiar looking call screen on your phone where you can choose to answer, decline, or decline with an automated message that gets sent to them in a, yep you guessed it, WhatsApp chat. The bonus of using WhatsApp to call someone is you can do it over a WiFi network, allowing you to make and receive phone calls in areas devoid of mobile signal. WhatsApp isn't the first service to offer this as Facebook Messenger has given you this option for a while - but seeing as the social network now owns both services it's no surprise they're beginning to mirror functionality. During our tests in the office audio was loud and clear, but a little delayed - no more than a second, but it was noticeable. For those of you rocking iPhones you'll have to wait for the call functionality to hit your platform, while there's currently no word on a potential release for Windows Phone or BlackBerry 10.